In 3-quart saucepan, cook beef, onions and garlic over medium heat 8 to 10 minutes, stirring occasionally, until beef is thoroughly cooked; drain. Stir in chili powder, oregano, cumin, salt, pepper sauce and tomatoes. Heat to boiling over high heat. Reduce heat just enough so mixture bubbles gently. Cover; cook 1 hour, stirring occasionally. Stir in kidney beans. Heat to boiling over high heat. Reduce heat just enough so mixture bubbles gently. Cook uncovered about 20 minutes, stirring occasionally, until desired thickness. 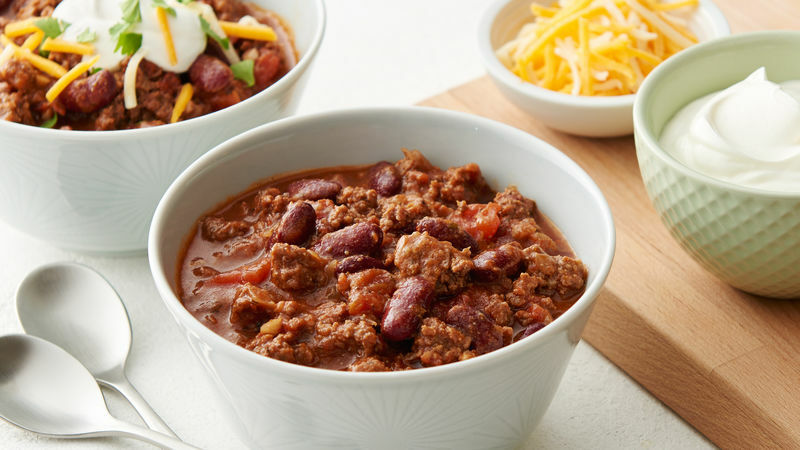 Lighten up your chili by browning up ground turkey, chicken or bison instead of ground beef. Look for other ways to enhance the basic chili powder—add a healthy shake of chipotle chili powder (smoked ripe jalapeños); for a smokier edge, try a generous pinch of ground coriander, cinnamon or allspice. Use this chili recipe to make Chili Macaroni: Spoon the chili over hot cooked macaroni or fusilli. Top with lots of finely chopped red onion, shredded Colby-Jack cheese and fresh cilantro leaves. Spoon the hot chili over baked russet or sweet potatoes for a big one-dish meal. Sour cream, chopped chives and crumbled bacon all add up to a loaded chili-baked potato supper. Most food historians agree that the dish we know as chili probably originated around the Texas region. But from there, as with many things about Texas, the lore, legends and tall tales begin to take over. One story puts forth the theory that immigrants from the Canary Islands brought a chili recipe with them when they settled in San Antonio in the early 1700s. Chili became the official state dish of Texas on May 11, 1977, when the state legislature declared, “the only real ‘bowl of red’ is that prepared by Texans.” Even if you aren’t from Texas, you can learn the basics of a perfect bowl of homemade chili in this handy How to Make Chili guide. It includes a step-by-step photo spread on chili-making basics, a time-tested recipe for cornbread to serve as a side dish and even tips on how to turn leftover chili into a next-day dish. If making this chili recipe has you interested in trying more types and variations, our best chili recipe collection includes many more ideas.